Find a vacation home to rent in Marienwerder from our list of vacation rental properties. Campaya has over 26 vacation homes available in Marienwerder, which give you the possibility to locate a unique accommodation in Marienwerder which completes your check-list in search for the perfect self catering vacation apartments in Marienwerder or vacation villas in Marienwerder. This house is located right in the first row at the marina the port village Zerpenschleuse. In the idyllic northern Brandenburg, between water, meadows and forests, the port village Zerpenschleuse arose. The port village Zerpenschleuse situated in the idyllic north of Brandenburg, between water, meadows and forests. Located in the newly created port village Zerpenschleuse this beautiful house is located in a Scandinavian style. 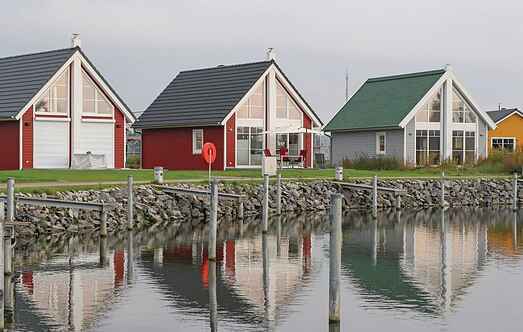 This cozy wooden house is located in a Scandinavian style between water and meadow. Between water and meadow, this cozy wooden house in the Scandinavian style in the port village Zerpenschleuse, right on the marina of cottage village. Here in the idyllic north of Brandenburg, between water, meadows and forests, the port village Zerpenschleuse arises. The port village Zerpenschleuse is located in the beautiful north of Brandenburg and provides an ideal base for exploring the idyllic surroundings. The beautiful house in a Scandinavian style architecture located in the first row at the marina the port village Zerpenschleuse. In the Old Harbor Village Zerpenschleuse the holiday properties are grouped around the recreational boating harbor. This well-maintained bungalow is located on shared grounds and offers modern and comfortable facilities. Directly in the holiday park Zerpenschleuse this beautiful wooden house is in Scandinavian style. Enjoy the waterfront location and the unique panoramic view of the boats of the port. In the first row, right on the marina the port village, this beautiful holiday house.